17 little things that definitely traumatized you as a kid. Twitter user Rob asked asked the site to share the things that felt like the apocalypse as children, when we assumed may before we knew that the apocalypse was actually 2017. Tell me something, that you thought as a child, was the end of the world. It's a trip down traumatic memory lane. 1. The Spice Girls themselves sang "FRIENDSHIP NEVER ENDS!" DON'T EVEN TALK TO ME ABOUT GERI LEAVING. JUST DON'T. 2. Reunited and it feels so good. Losing my teddy bear when out for a walk. Posters were put up, searches were made. Teddy was brought home safely to me. I still have him ? 3. Y2K was tough for everybody. When the clock struck 12 for the year 2000. ? 4. Well, that's Theo's loss. Passing a note to Theo Williams asking him to my 13th birthday and him saying no. 5. That would be convenient. 6. Living on borrowed time. 7. Obama's coming for our GAMES. Me and my brother shouted at a cow. It slipped and fell over and we thought we had killed it. "Oh my god" is right. 9. Cruel and unusual punishment. When I cut a chunk out of my hair so my Mum stopped me from watching Fame that week. Heading to my grandparents' for the weekend, I dropped and broke my VHS copy of Back to the Future Parts II and III. 14. 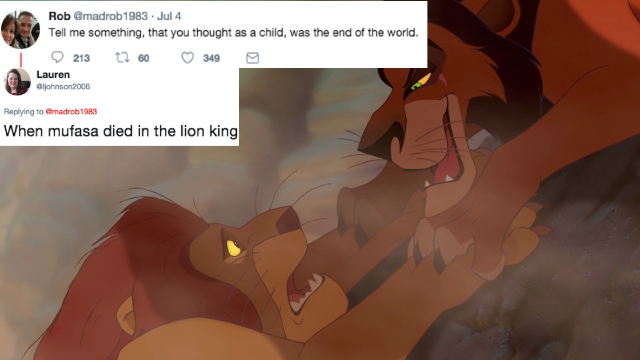 It's the circle of life. Still not over it. Never will be. I idolised Mohammad Ali so much, I was ridiculously bereft when he lost to Leon Spinks. Inconsolable. 16. Takes your breath away. 17. On the right track.